Over the course of our partnership with The Museum of Flight, The Keller Group has been honored to plan, manage and execute a number of events including the groundbreaking, dedication and grand opening of the Charles Simonyi Space Gallery as well as the arrival of NASA’s Super Guppy aircraft and corresponding delivery of the Space Shuttle Trainer. One of the most exciting and heartwarming events we planned was the Grand Opening of Raisbeck Aviation High School (RAHS). For the October 2013 grand opening of RAHS’ new $43.5 million facility on site at The Museum of Flight, we worked with Museum staff, Boeing, Alaska Airlines and RAHS and Highline School officials to develop and manage a day of events showcasing the school’s new facility and its unique partnership with The Museum. 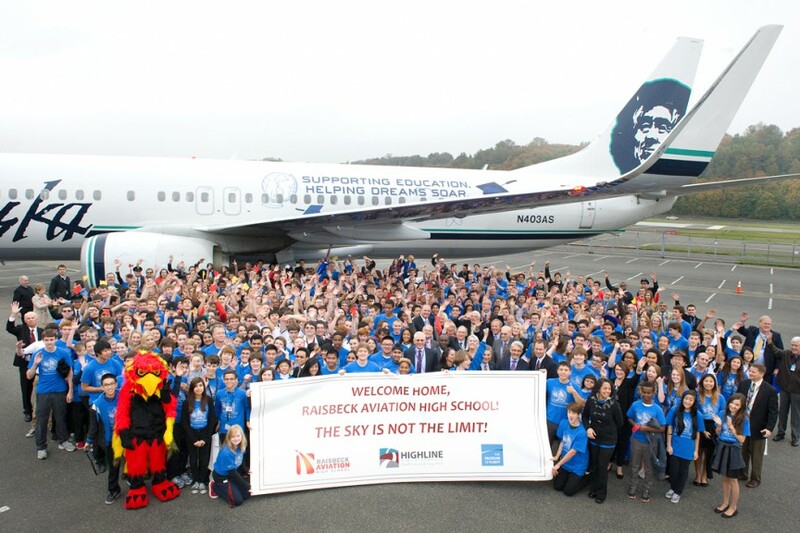 The morning’s festivities began when an Alaska Airlines 737-900ER – dubbed the “Spirit of Education” delivered more than 100 students and honored guests to The Museum of Flight. The passengers were greeted by a cheering crowd of more than 600 RAHS students, alumni, parents and invited guests. A formal program followed, featuring remarks from Governor Jay Inslee, King County Executive Dow Constantine, Alaska Airlines CEO Brad Tilden, and CEO of Boeing Commercial Airplane Ray Conner. Coverage of the Grand Opening reached a total of more than 6,835,425 people, from the cover of the Seattle Times local section to the evening news broadcasts throughout the Pacific Northwest.